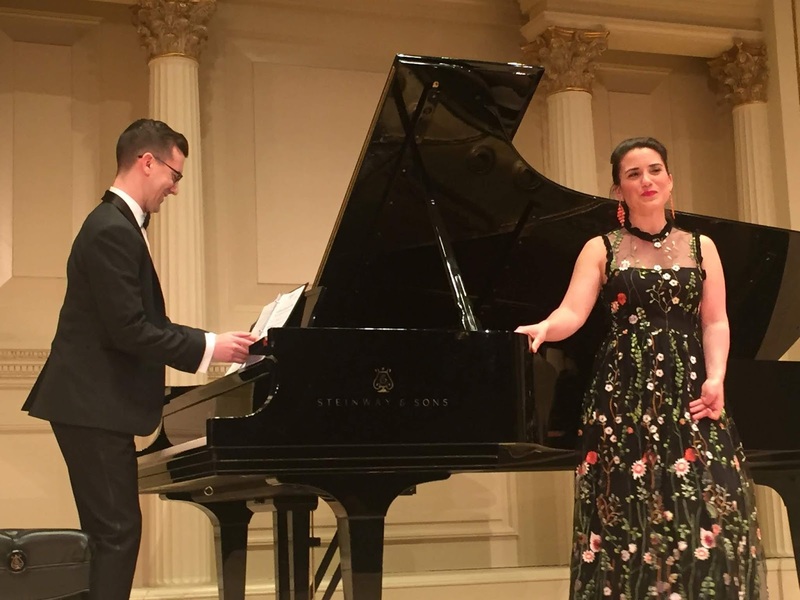 At a time when vocal recitals are becoming increasingly scarce, we lovers of classical voice can count on Carnegie Hall, which presents vocal recitals in all three halls--Stern, Zankel, and Weill. We are particularly fond of the series at the intimate Weill Recital Hall which facilitates the intimate connection so necessary for the appreciation of art songs. Last night's recital was satisfying on many levels, introducing us to a soprano of distinction whom we had never heard before, although she is well known as a recitalist and in symphonic works with vocal movements. Joélle Harvey is particularly recognized for her Mahler and we wish there had been some Mahler on last night's program. What struck as about Ms. Harvey was her bright tone, the clarity of her diction, and her facility with languages. Indeed, we heard her in English, German, French, Italian, and what we took to be Norwegian. Actually, we are not familiar with the Scandinavian languages but since Edvard Grieg was Norwegian, it's a good guess. The program spanned the Baroque period right through to the contemporary one for which we lack a title. Perhaps "Post Modern" will suffice. The program opened with a set of songs by Henry Purcell, England's most famous composer for the voice. We don't believe anyone has matched his ability to choose good text in English (can't go wrong with Shakespeare!) and to amplify the text with singable melodies and pleasing harmonies. However, our favorite of this set was "Sweeter than roses", the text of which is declared to be "anonymous". The text gave Ms. Harvey the opportunity for maximum variety of tempi, dynamics and word coloration. We loved the passion and the ardent melismatic passage. A set by Mozart reminded us that Mozart could bring out the beauty of texts from any language. "Ridente la calma" is always a pleasure and Ms. Harvey brought out the beauty of the Italian vowels. "Oiseux, si tous les ans" was charmant and sung in fine French. The long legato lines persisted through the German lied "Die Zufriedenheit" which bears a lovely message of contentment. "Die kleine Spinnerin" was new to us and we would have enjoyed it more if Ms. Harvey had differentiated between the voice of the spinning girl and that of the young fellow importuning her. The singer's German was even crisper in four songs by Clara Schumann which were our favorite part of the recital. We are always overjoyed to hear her songs in recital and particularly "Liebst du um Schönheit" which is refreshingly different from the Mahler setting, perhaps more tender and less exuberant. "Die stille Lotosblume" had some lovely dynamic variety and a wrenching change to the minor mode. A set by Edvard Grieg focused largely on nature and Spring. Although we liked the sound of Norwegian our favorite song was "Osterlied" sung in German. "En fugelevise" limned a strange and beautiful scene between two lovers who would never see each other again for unexplained reasons. With a text by Ibsen, one could just imagine! The song cycle Vanitas by contemporary composer Michael Ippolito did not enchant us vocally for the usual reasons. None of the poetry seemed to want to be set. "Quivered out of decimals", "degreeless noon", and "decades of arrogance" are just three examples of phrases that seemed unmusical to us. The one song that seemed interesting was "A Feather" with Gertrude Stein's nonsensical text leading to some clever vocal effects. Although Mr. Ippolito is a long-term friend of Ms. Harvey's, we did not find his vocal line interesting or even kind to her voice. As usual our attention wandered to the piano and we realized that Mr. Ippolito writes very well for the instrument. Collaborative pianist Allen Perriello, so accurate, straightforward, and supportive during the entire recital, was given a chance to play Mr. Ippolito's highly original composition with style. We were glad that the encore was tuneful. It was "Remember Me" by Kristen Anderson-Lopez and Robert Lopez from the Disney film Coco. Apparently, popular song writers known how to craft a tune! Ms. Harvey sang it with personal involvement. It was lovely!